A Slice of Swedish Hospitality | Get in touch with us! 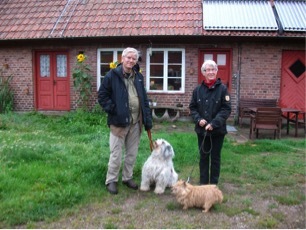 We are a couple recently retired, living since 2011 in an old farm house in the center of Skåne, in a beautiful old style landscape. Before retiring, we worked at Lund University, Suzanne with Romance Languages and Folke with Human Ecology. We are both interested in nature and biological diversity, in watching birds, plants, butterflies or bats. 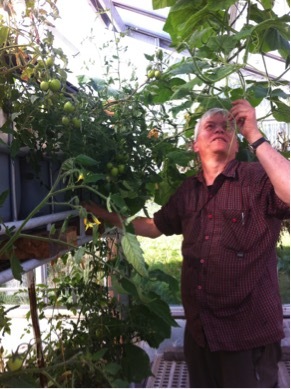 Folke is above all interested in systems ecology generally, and in ecological cultivation of vegetables and fruits, with recycling of nutrients, and in practicing sustainable living. Suzanne has been living for many years in France and in Germany, is interested in languages and in meeting people from other cultures. She speaks French and German fluently. We live here with our two dogs, two cats, ducks and chicken. The farm we live in is from about 1810, with old stables and barns. It belonged to the church and the farming furnished the income of the priest. 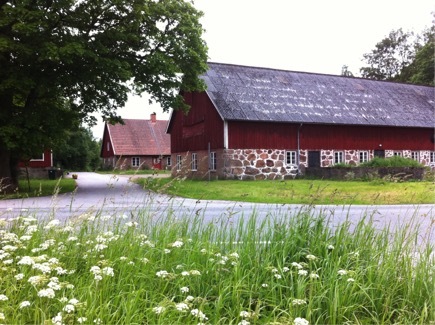 “Prästabonnens gård” means roughly “The Vicar’s Farmer’s Farm”. Nowadays the buildings and fields are separated, and there are no more cows, pigs or horses. But our chicken and ducks, moving around freely , give us very good eggs, and in our rather big ground we cultivate potatoes, onions, beans, tomatoes etc. We are trying to make this place a “Transition farm”, i.e. to show how one can live in a sustainable way, in a future where fossil fuels, phosphorus etc are sparse. This means that our cultivations are ecologically adapted, and we always consider the circulation of nutrients. Folke is just constructing a Water Greenhouse, which is intended to serve – beside cultivation of plants – to purify the grey water from the house. He combines this with Aquaponics, that is, he will also cultivate fish in it. But already in the first summer we got lovely tomatoes here of all kinds. We both love to eat good and healthy food. Folke is interested not only in the cultivation of ecological food, but also of cooking it. The meat we eat comes from our neighbor’s naturally bred animals (sheep, pigs, calves, ducks), or from nearby small scale farming (chicken). The vegetables we eat, if not from our own garden, also come from small scale ecological cultivations nearby. The hunter of the village brings us wild boars and we get fish from the nearest lake. Among our favorite dishes are wild boar or lamb in a ragu with root vegetables; pike (Hecht / brochet) or other lake fish, with horse radish and potatoes. We love slow cooking in our wood heated stove. Suzanne, who has been living in France, likes to combine the Swedish food tradition with some of the French customs: start the dinner with Apéritif and Hors d’Oeuvre, drink French wines and end with some good dessert cheese. Folke also likes to prepare vegetables from the forest, e.g. nettles or wild garlic. 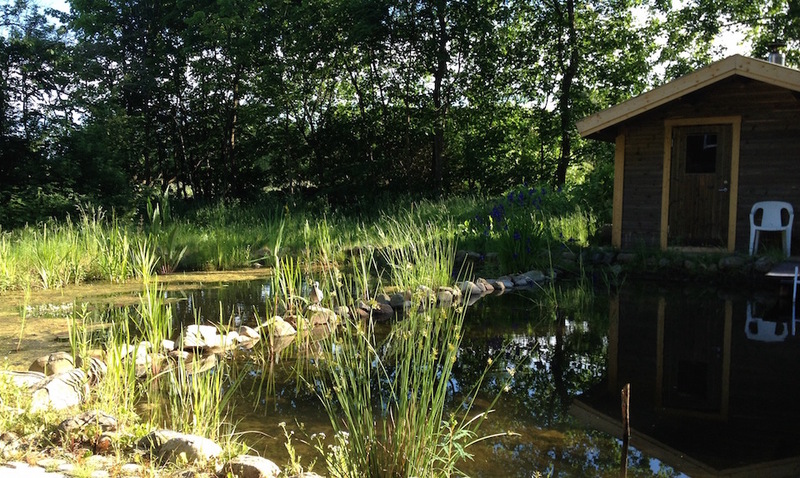 In the garden we have a wood heated sauna beside a ”natural swimming pool”, where you can swim in cool water after the heating in the sauna. We also have a guest house in our garden. It is a big house with rather simple standard, with three sleeping rooms. You are welcome to book this and to stay over night if you want to. We would be pleased not only to invite you for dinner or lunch, but also to walk around with you showing our farm and discuss environmental questions, or show you birds and butterflies in the surrounding forests and fields. Prästabonnens gård is situated in a very beautiful region, with forests, small fields, lakes, old stone walls, etc. It is not far from Ringsjön and from the Fulltofta natural reserve. We are available any time of the year with some exceptions (Easter, 1 June, Christmas). More about us and possibility to rent our guest house!